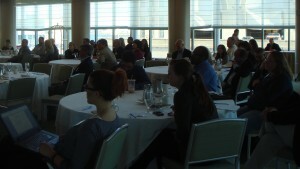 AllergyEats’ Inaugural Food Allergy Conference for Restaurateurs a huge sucess! 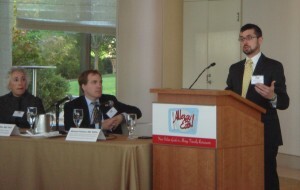 AllergyEats recently presented The Inaugural Food Allergy Conference for Restaurateurs: What Every Restaurant Should Know About Food Allergies To Ensure Safety & Maximize Customer Engagement, Loyalty, and Revenue, an educational event for people in the restaurant industry. Participants – including food service operators, chefs and restaurant owners – heard from an impressive panel of industry experts, who explained how to become more knowledgeable and accommodating about food allergies. 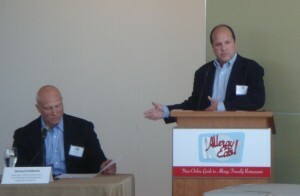 Rich Vellante, Executive Chef and Executive Vice President of Restaurants, Legal Sea Foods, Inc.
Steve Silverstein, Founder/CEO, Not Your Average Joe’s, Inc.
Paul, a former fund manager for Fidelity Investments who now runs AllergyEats, serves on the Board of Directors for the Asthma and Allergy Foundation of America and is a passionate food allergy advocate, also served as a panelist. Peter Christie, President and CEO of the Massachusetts Restaurant Association, welcomed the crowd, praised AllergyEats for organizing and implementing the event – the first of its kind – and vowed to partner with AllergyEats on similar events in the future. Then, during four separate panel discussions, the experts provided valuable information, tips and advice about accommodating food-allergic guests, reducing the fear around serving guests with food allergies and building customer loyalty and profits by becoming more allergy-friendly. The experts explained that the prevalence of food allergies and intolerances has risen in recent years and, therefore, it’s imperative that restaurateurs be able to comfortably accommodate food-allergic guests. One mistake in the kitchen could be deadly for a guest – and could result in a restaurant-ending fallout. “Ignorance is the main risk,” Peter Christie, CEO of the Massachusetts Restaurant Association, told the crowd, adding there’s a potential for danger that exists when food isn’t handled properly. Panelists shared their own personal stories. Michelle Carrick talked about her son, Michael, who was diagnosed with extensive food allergies at a very young age. Because his list of allergens was so long and complex, Carrick was always extremely careful, cooking many of his meals and snacks at home, and asking extensive questions about ingredients and food preparation when they dined out. When Michael was still a young boy, they attended a family party in rural Pennsylvania. Carrick had baked a batch of “special” chocolate chip cookies – without nuts, dairy, soy and Michael’s other food allergens – which they placed on a table for all of the party guests to enjoy. Another guest had brought a different batch of chocolate chip cookies – containing peanut butter, among other things. Unaware of Michael’s allergies, the other party guest innocently consolidated all of the cookies, combining her batch with the treats that Carrick had baked. Young Michael helped himself to a cookie – believing they were the “safe” cookies that his mother had made – and had a severe allergic reaction, which included trouble breathing. Because they were in such a rural area, Carrick opted not to wait for an ambulance to reach them, instead driving Michael to the closest ER herself. During the ride, his reaction was so severe that she worried he would die en route to the hospital. Luckily, the ER team was able to save him, and today, he’s a healthy adult who still has multiple food allergies and takes every precaution to avoid his trigger foods. Carrick’s story illustrated how serious food allergies can be and how even one bite of an allergen could be life-threatening. The physicians explained the basics of food allergies, describing the various symptoms that people with food allergies may experience and why these reactions occur in certain people. They described the spectrum of reactions, ranging from mild stomach upset to potentially life-threatening anaphylactic shock. People with food allergies can’t “cheat” – ingesting even a small amount of their trigger foods could cause reactions, which could include hives, difficulty breathing or swallowing, gastrointestinal distress and/or other symptoms. 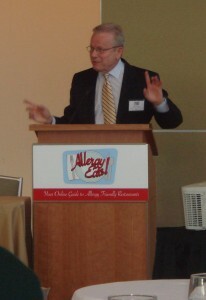 During the conference, multiple speakers referenced the Big 8 allergens – dairy, fish, shellfish, peanuts, tree nuts, wheat, soy, and eggs – which represent the most prevalent food allergies. But they also added that people can be allergic to a variety of foods, from strawberries to cinnamon, so proper food allergy protocols are essential. Train your entire staff about food allergies. Investing in training will make your restaurant safer. Period. And don’t just train your managers and servers – also train your bartenders who may be serving meals, your busboys who are cleaning tables, and everyone else on your team. Encourage your staff to engage in a dialogue with every guest. Ask from the onset about any food allergies or intolerances and understand exactly what each food-allergic guest must avoid. Have a clear communication protocol between the server, the manager, the chef and the rest of the kitchen staff. Explain exactly what the guest needs to avoid and have a system to ensure the safe preparation and delivery of each meal. Be familiar with every ingredient in every dish. Always read labels and consider ingredients down to the sub-particle. For instance, a guest that’s allergic to cinnamon can’t eat Old Bay, a spice blend containing that ingredient. Avoid cross-contamination. Don’t use the same knife that you used in peanut butter to cut veggies for another dish. Use clean pans, cutting boards, utensils, etc. and clean all surfaces thoroughly. Consider every potential source of cross contact. Realize that fryers, sanitizing dip buckets, high chairs, table tops and sponges/dishrags can all carry traces of food allergens. Use all fresh ingredients (not mis en place – or bowls of already prepped ingredients) for food-allergic guests. Understand that pre-set bowls of ingredients may have become cross-contaminated by a food allergen. 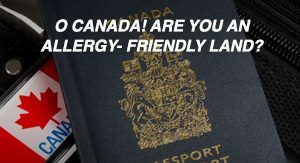 Flag allergy-friendly meals. Restaurants have different ways to identify special meals – double plates, different colored plates, frill picks, etc. By using specific methodologies, your staff will be able to clearly and effectively identify special meals for food-allergic guests. Recognize the “aliases” for food allergens. Make your team aware that allergens may have more than one name. For instance, casein and whey are dairy. And be aware of “curveballs.” Many brands of soy sauce contain wheat. Worcestershire sauce contains anchovies (fish). Barbeque sauce may contain tree nuts or wheat. Read every label. Designate certain equipment as allergy-friendly. Consider color coded tongs, pan handles, etc. to differentiate this equipment. Invest in in-person food allergy training, whenever possible. But recognize that online training tools and resources can be hugely beneficial for restaurants with limited budgets. “You are as strong as your weakest link,” Vellante continued, adding that “leadership sets the tone,” so restaurant owners and managers should demonstrate why it’s so important to accommodate food-allergic guests and make this part of their culture. 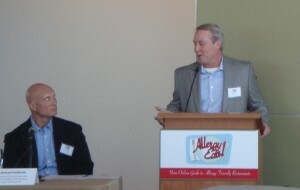 The experts also explained how allergy-friendly restaurants can experience significantly greater profits. Recent studies indicate that 4% of the US population has food allergies, and an additional 1% has celiac disease and can’t tolerate gluten. These food-allergic and intolerant guests don’t dine alone, and they often dictate the restaurant for their entire party. 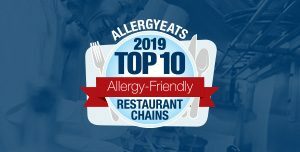 By accommodating food-allergic guests – and, as a result, their family, friends and associates – allergy-friendly restaurants could win 10% or more of the market share. 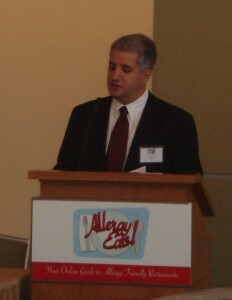 Steve Silverstein, Founder/CEO, Not Your Average Joe’s, Inc., said that approximately 10% of their customers were people with food allergies and those guests’ friends and family members. 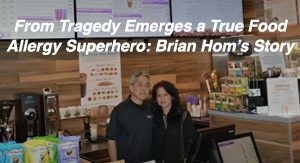 He said that the foundation of his business – and the reason his chain of restaurants is so successful – is because of their commitment to take care of their guests, which includes their willingness to accommodate people with food allergies. “The effort [of becoming allergy-friendly] is definitely worth it,” said Jim O’Brien, Owner/CEO of independent restaurant Jake’s Seafood, who explained that the money he’s spent on tools and training to become more allergy-friendly has been returned to the business through increased sales, profits and loyalty. He also told the audience that his gluten-free fried fish program has been such an “amazing success” that they’ll have to expand to meet the growing demand. “A gentleman came in and had fish and chips for the first time and had tears [of happiness] in his eyes,” O’Brien continued. 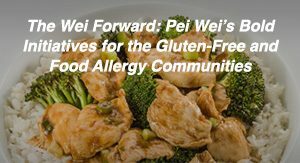 “The food allergy community is extremely loyal to restaurants that accommodate them. 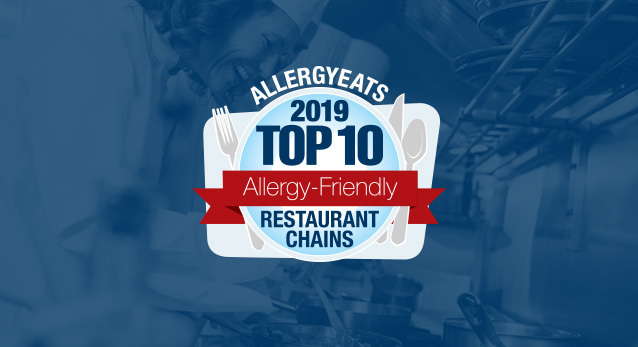 More than 85% said allergy friendliness is a main reason that they choose a [particular] restaurant,” said Paul Antico, CEO/Founder of AllergyEats. He added that when he dines out with his family of seven, they only choose restaurants that can accommodate his food-allergic children. Antico explained that even a minor investment in allergy-friendliness training will result in significant increases in profits. He said that allergy-friendly restaurants can experience a 25% increase in profits on just 10% additional sales with a return on investment well into the thousands of percent. Additionally, a variety of sources suggest restaurants are experiencing a 1-10% increase in revenues after introducing gluten-free menus alone. The American Society for Training and Development (ASTD) reported that restaurants that invest in training have a 37% higher profit. As an added benefit, studies have shown that when restaurants invest more in their staff, they experience lower turnover, which means fewer staff members to train. 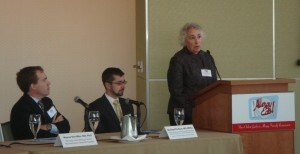 Conference attendees praised the event and raved about the panelists. 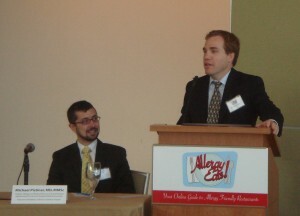 “It was a pleasure attending the AllergyEats conference, which was given by such a knowledgeable panel of professionals. I would highly recommend this [conference] to my fellow employees and peers who are interested in Allergen Awareness in the food service industry,” said Ron Tulotta, Food Safety Director, Quality Assurance Department at Compass. “Your conference was amazing! I learned so much from it and I applaud your countless hours of preparation and execution. 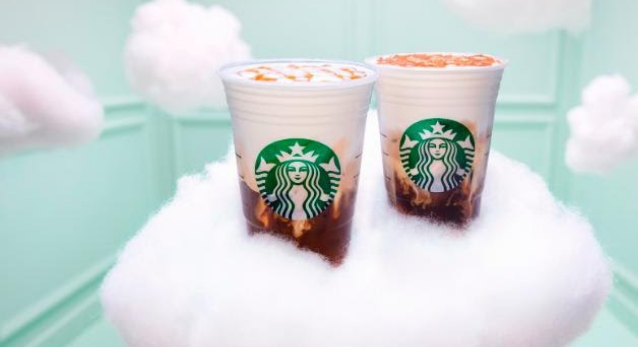 [The] speakers were amazing,” said Junehee Kwon, PhD, RD, Associate Professor, Department of Hospitality Management and Dietetics at Kansas State University. 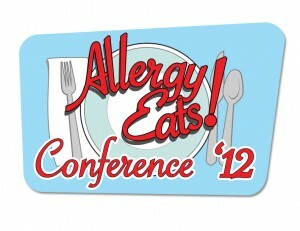 Antico is planning additional food allergy conferences in the future and will share details as they’re confirmed. 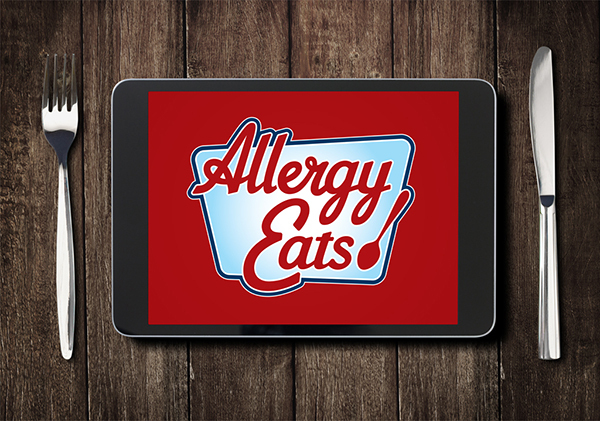 Fabulous site to read about your work…my daughter and two of my granddaughters have food allergy issues. Eating out has been limited to Joe’s American Bar & Grille because of their gluten-free macaroni & cheese…delicious. But other places do not seem to have as good dishes as my girls favorite dish is Mac & cheese. Your workshops should be state mandated in my opinion…not just an idea for SOME restaurants…ALL should be taught about the dangers of food allergens for customers who need to be taken care of properly. As an educator for 40 years, I would offer my services to assist your group in the “teaching” of proper food handling and presentation and offering for people with special needs…if you will allow me to frame it this way…because “ignorance” can kill.